In 1951, when corporate off-sites took place in settings more luxe than chain hotel ballrooms, a dispute took place between Sir Hugh Beaver, managing director of Guinness Brewery in Dublin (are all CEO's over there knighted?) and a guest at a shooting party at his estate in County Wexford. The dispute centered on which was the fastest Eurpean game bird. No reference book gave a definitive answer. The royal director decided to publish a volume of facts, intended to be sold to bartenders who could use it to settle pub arguments. The first Guinness Book of Records was published in August, 1955 with a plastic cover to protect it from beer stains. Despite skepticism from retailers, the volume became an instant hit. It reached bestseller status by Christmas the same year. Over a hundred million copies have been published worldwide in 25 languages. Over 3 million are still sold every year, the best-selling book under copyright of all time. Hats off to Sir Beaver and his prescient marketing move. But is it truly successful as branded content? Do consumers associate the purveyor of brew with best known arbiter of facts and factoids? I didn't until reminded of association by New York Times article. And Alan Wolk of the Toadstool blog observes that book's popularity is highest with kids too young to (legally) be target for Guinness. Still, selling millions of book objects these days is a feat to be marvelled at. Doesn't sound like the original intent was branding. The thing is, I never knew this. 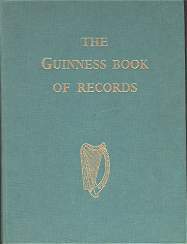 I never heard this story and never associated the "Guinness Book of" with Guinness; and I drink their stout. What a great story whether or not it's a great branding anecdote. Amazing I never knew the connection with one of my favorite beers! I have seen the Guinness WR Museums and NYC and LA many times (though never went inside one). And considering I have had many many Guinness Stouts in my life what does this say about the branding tie in.